What is the point of the infrared focus markers? I am talking about the red values that comes after the infinity value. Why do they exist and how do you use them properly? Lines associated with different focal lengths in various colors. Such lenses are varifocal zooms, where the focus point changes with the focal length. This is in contrast to parfocal zooms, which maintains focus when focal length is changed. Lines associated with aperture F-numbers in various colors. These are depth of field indicators. Red dots and lines, often unmarked, such as what osullic describes. These are infrared focus indicators. They are used to correct focus when using infrared film. They are often not needed for digital infrared because focus can be adjusted using Live View. Dots or lines near the aperture ring. Often associated with the letters W or T. These show the aperture range for wide and telephoto focal lengths on variable-aperture zooms. According to the EF70-200mm f/2.8L IS II USM manual, the red 70 and 100 are infrared indices (emphasis added). The infrared index corrects the focus setting when using monochrome infrared film. Focus on the subject manually, then adjust the distance setting by moving the focusing ring to the corresponding infrared index mark. The infrared index position is based on a wavelength of 800 nm. The compensation amount differs depending on the focal length. Use the indicated focal length as a guide when setting the compensation amount. Be sure to observe the manufacturer’s instructions when using infrared film. Use a red filter when you take the picture. Focal length --- The distance from the lens to the image plane when the camera is focused at infinity ( ∞ as far as the eye can see). The flag on the field --- each color of light comes to a focus at a different distance. Violet has the shortest focal length because violet has the shortest wave length. Green comes to a focus next, followed by yellow, then red. Infrared comes to a focus the furthest downstream from the lens because infrared has the longest wavelength. Because each color comes to a focus at a different distance from the lens, the size (magnification) of image for each color will be different. The longer the wavelength, the greater the projection distance (lens to image), and the larger the image will be. This phenomenon is called “Chromatic Aberration”. Hat’s off to John Dollond, an optician, in 1757; he configured a lens array consisting of a strong positive lens made from flint glass and a weak negative lens made from crown glass. This combination mitigates but does not eradicate chromatic aberration. His lens creation is called an achromatic lens (without color error). In this design, the red image and the blue image come to a focus on the same plane. Lenses that are not well corrected for chromatic aberration display a color fringe that outlines the rim of objects. This fringing is due to the fact that the total image is comprised of an array of different size images. The longer the projection distance -- the larger the image. Camera lenses are not usually corrected for the extra-long throw of infrared because mostly we image in the visual range. If we image in the infrared range of frequencies, these images will be out-of-focus unless we manually make a correction. Hence, infrared has its own focusing index marked on the lens barrel. Look at this image - the engraved distance that aligns with the larger black dot is the distance that is in focus for normal photography. The distance that aligns with the smaller red dot is the distance that is in focus for infrared photography. The lens focuses visible light and infrared light in different ways, so the lens is focused on a different distance depending on if you are photographing using visible light or infrared light. 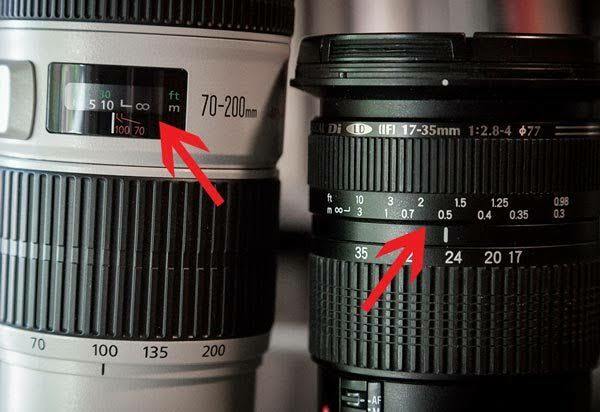 The 70-200mm lens shown has two infrared indices, one for 70mm and one for 100mm. Since IR filters block visible light, the markings are used for manual focus using the range scale rather than the viewfinder. As far as I know, those markers are related to infrared light. Because infrared have longer waves than visible light, lenses need different markers when you take photos for infrared photography. Not the answer you're looking for? Browse other questions tagged focus infrared or ask your own question. Infrared Photography - How to set White Balance? Why don't most cameras use infrared for focusing? How do waterproof lenses focus underwater? How was this High-Resolution Short-Wave Infrared image captured?